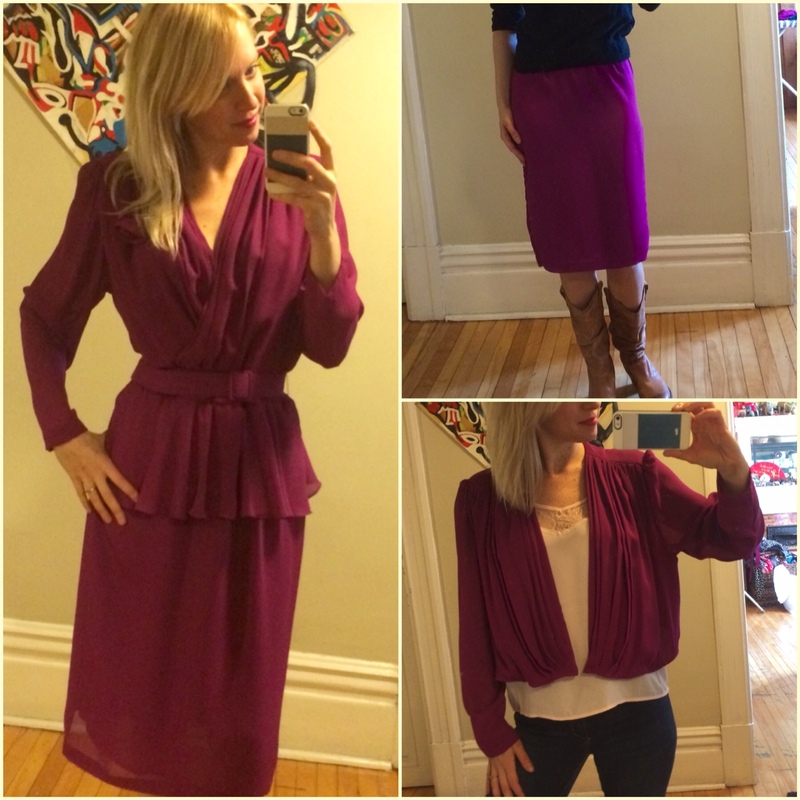 This week’s Sewing-It-Forward project was transforming a violet chiffon D’Allaird’s dress into updated and fashionable pieces. I used the bottom portion of the dress to create an elastic waist pencil skirt and a cardigan blouse from the top portion. D’Allaird’s was a Canadian clothing store, a subsidiary of Marks and Spencer, founded in the mid-70s and closed in 1996. I have to admit the original number wasn’t terrible. I know Vie Domestique would second that notion and even went as far and said she liked it. And I quote, “J’aime un peu ça. Shame on me”, she wrote after I had I texted her the before photo. Haha- busted! The truth is, the dress was beautifully constructed- it accentuated the waistline properly and draped nicely, but it was dated and had been sitting in the donation boutique at the women’s shelter for too long. I stitched ripped the bottom skirt from the top blouse. I measured my hip circumference and added a couple of inches. I cut the bottom fabric into a large square using the measurements. I sewed the two pieces of chiffon in place. Chiffon moves and shifts too easily and I can honestly say I don’t enjoy sewing it. I managed to sew the side seams of the skirt while keeping the original back bottom hem slit in it’s proper place- the middle. I created an elastic casing with the top hem and slipped in an inch wide elastic. Refashioning the top portion into a cardigan style blouse was far more simple to create however it did require a lot of carefully executed stitch ripping. I separated the blouse portion from both the skirt and from what I’ve been calling the waistline-skirt, that extra bit of flowy gathered fabric (see before photo). I stitch ripped the blouse open, separating the left and right fronts and then double hemmed the bottom so it wouldn’t fray. The double hemming also provided more weight for nice draping. And voilà, two lovely wearable pieces for some new owners! Using the Burda pattern as a gauge for armhole & bust/waist sizing. Deconstructing the shirt to make it new again. I followed similar steps I had applied to last week’s sweater deconstruction to refashion this men’s denim button up. I started by separating the front and back and cut off the sleeves. 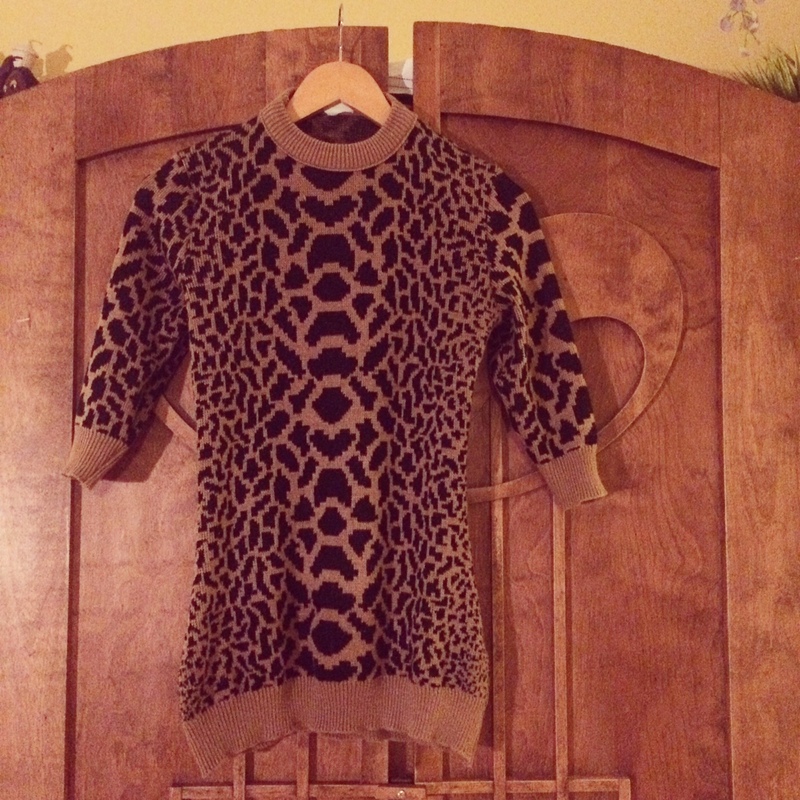 I then used this Burda pattern for size gauging and then drafted the front collar myself. I kept the sleeves long but loose enough for the option to roll them up. I’ll admit that I got a little lazy with the collar and opted to do without interfacing. The structure of the denim compensated well for my laziness, however I did insert interfacing to the bottom hem which has given it a clean structured finish, noticed especially when worn closed. I have a few more shirts and many T-shirts….got any ideas? I’m thinking of mixing in another type of fabric for the next one. Thoughts? Rejuvenation has been the theme of the past couple weeks. 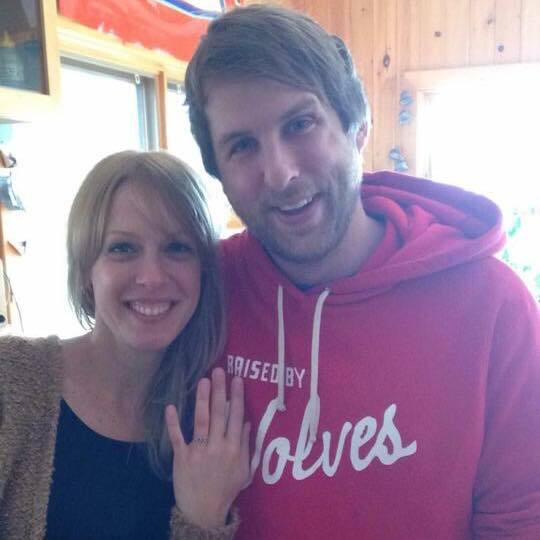 I’m thrilled to announced that Etienne proposed over Thanksgiving weekend and I, of course, said YES!! It was incredibly romantic; sitting on a cozy blanket on the dock by the lake, hot homemade cocoa in hand and my best friend on bended knee. 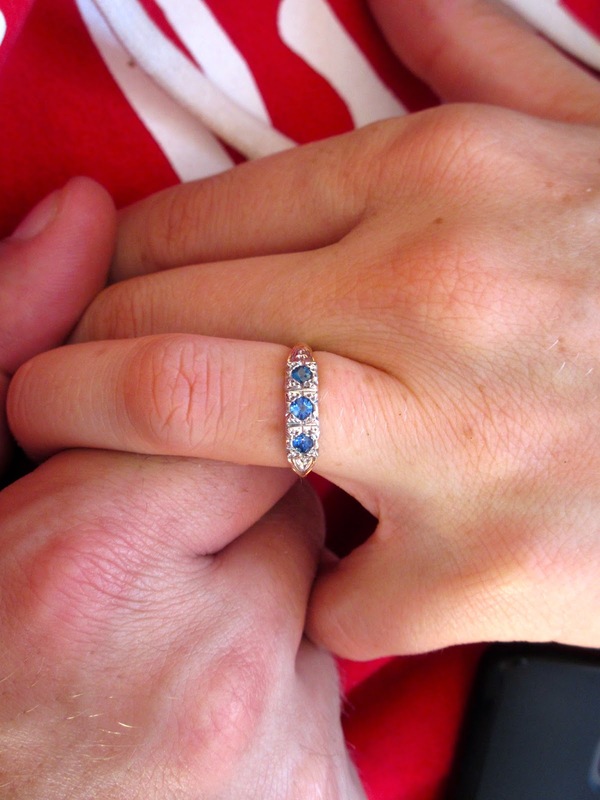 It was also incredibly us in the sense that his proposal was made in a spot we both love, on a weekend we share with friends & family and with a vintage sapphire ring. Etienne chose a beautiful ring from the 1940s, a perfect choice with its understated elegance and sparkling sapphire stones. 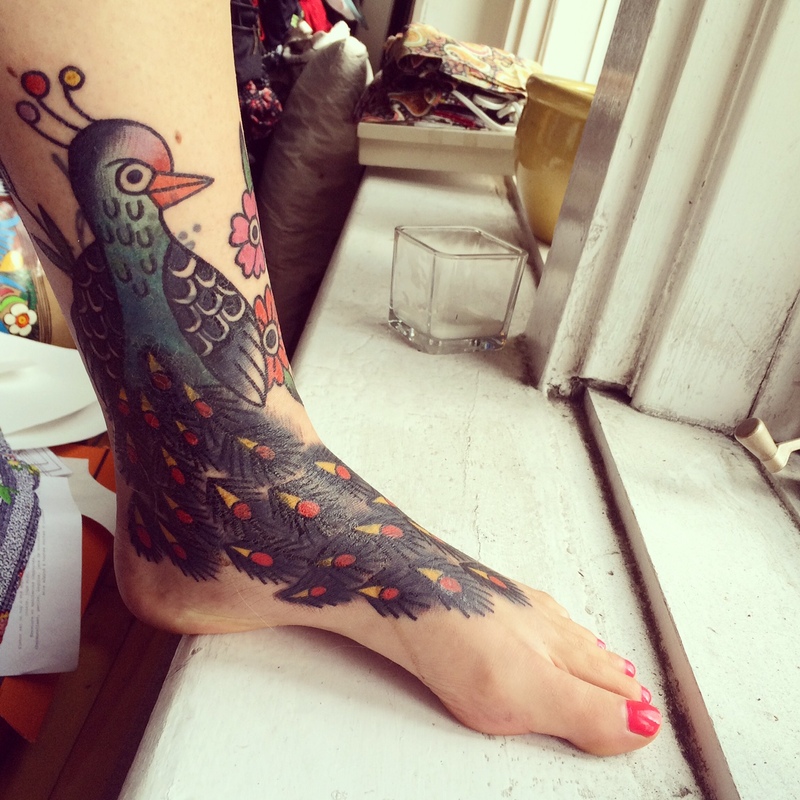 The following weekend my old ankle tattoo was redesigned and rejuvenated into something new & beautiful. Over the past 15 years, I had tattooed little additions to a growing tattoo. I collected flowers, leafs and dare I say tribal designs (it was the 90’s!) with friends. They signified great memories with good friends but had created an awfully disorganized design mess on my left ankle. I spent Saturday night at Jessi Preston‘s Two Horses studio, where Jessi designed & tattooed a beautiful peacock & flowers over my tired and faded tattoo. I couldn’t be happier with the results!! 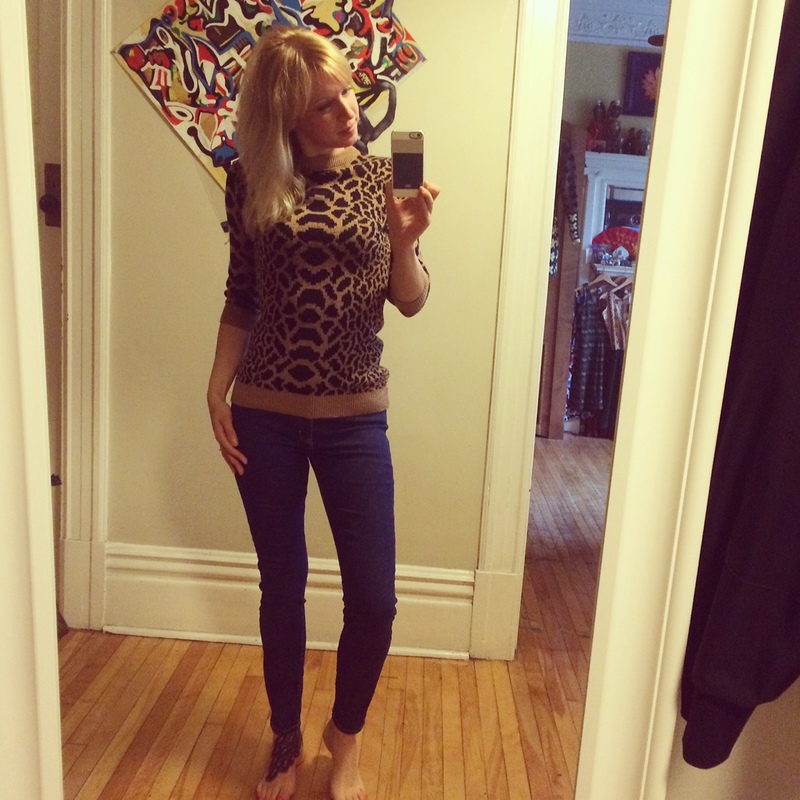 In keeping with renewing old art and because I remained home these past few days healing with my left leg propped up high on a cushion, I gave an old sweater a new life. 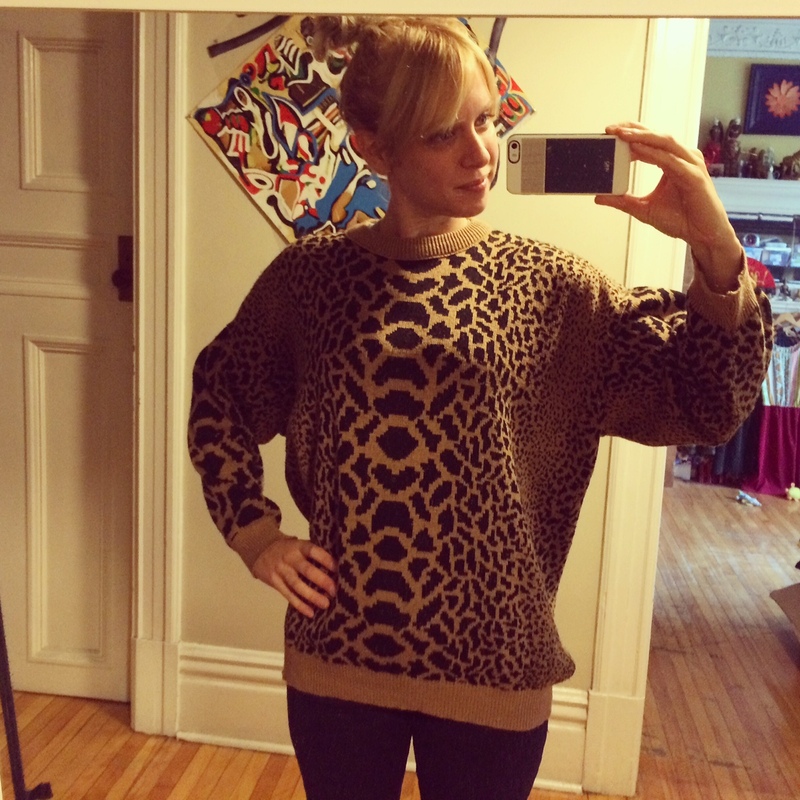 I had purchased this cozy oversized leopard print sweater at Village des Valeurs a few years ago and she was beginning to look rather tired. 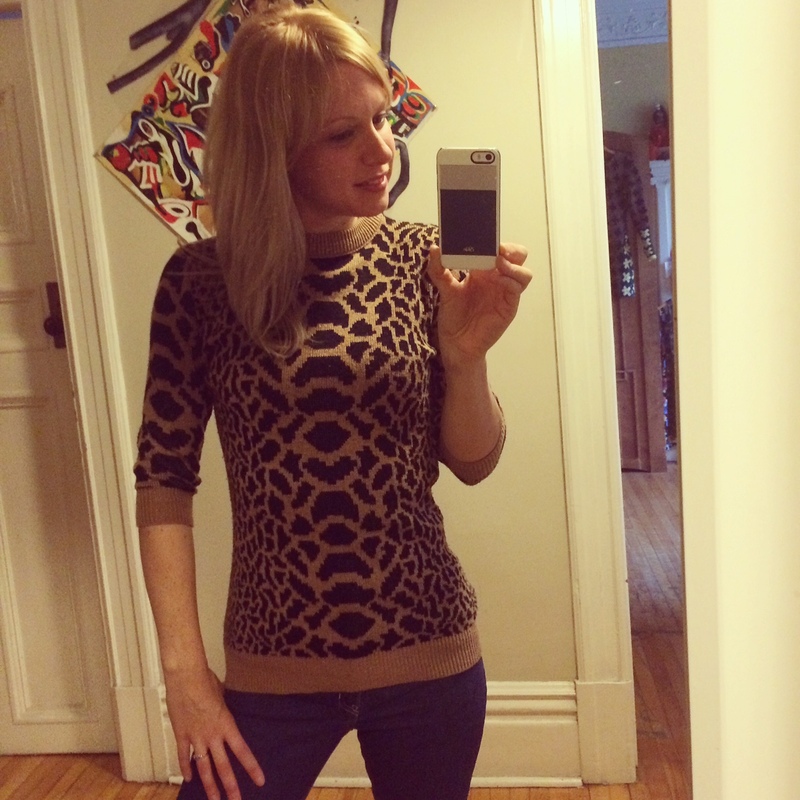 I cut off the sleeves, separated the back and front and guided by the Burda Knit top/dress Sloper pattern, I redesigned her into this lovely fitted crew neck sweater. I made a Burda Jacket yet broke a few rules as per usual 🙂 I used ivory lace with slight stretch instead of the stretch jersey and I redrafted the facing making it wider. I also opted out of the interfacing as the the type of lace (feels like linen but stretches like cotton) I used provided enough structure. Paul Simon’s Graceland album. Brilliant.